Our J08 Smart Tag (Order P/N: HKRHT-J08) and J09 (Order P/N: HKRHT-J09) are being popularly used. Due to the growing market demand, an advanced version is successfully developed. Hong Kong RFID is glad to announce the launch of a new Smart Tag for our jewellery management system – J10 (Order P/N: HKRHT- J10). For those who concern the environmental issue as well as durability and beauty, we are now launching a J10 Smart Tag which is able to do PETG Encapsulation, instead of PVC. It is robust and solid with customizable printing appearance; it is reusable and low cost. Also, J10 has ROHS compliant to ensure the highest quality standard in part per million level (ppm). The mat surface can provide a better adhesive force even for labels with weaker glue. User can now "Slap and Fold" the smart tag into their existing price tags firmly; customer can form their own distinctive smart price tags. It is convenience and easy to use. The hole for hanging strings is now located near the centre of the tag. After the successful launch of the previous 6th and 7th generation smart tag, J08 is popular for its high reliability and good sensitivity while J09 is using the same design but optimizing the use of light weight material. J10 is more durable and not easily ripped. 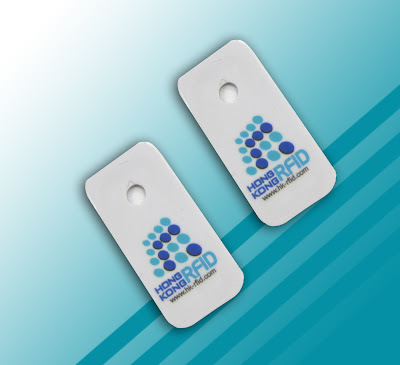 Hong Kong RFID has dedicated to design better tags for our jeweler clients over years. The product is available from December 2008.